Combining advanced personal development behavioural change models to enable the changes you want. 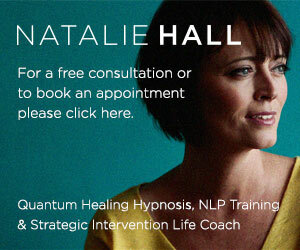 As a fully qualified Advanced Hypnotherapist since 2004, Neuro Linguistic Programming Trainer and Strategic Intervention Life Coach (The Anthony Robbins and Cloe Medanes method of Life Coaching), and Quantum Healing Hypnosis Practitioner™ (The Dolores Cannon Method which includes Past Life Regression, Future Life Progression, your questions answered by the Subconscious and Healing). I am also registered to the Complimentary & Natural Healthcare Council CNHC reg number: oooo22-A12. The advanced techniques offered help people break free from destructive thoughts, behaviours and habits enriching all areas of life and relationships. One-to-one appointments are held in relaxation in the Coastal area of Bournemouth. There are plenty of commuting links including a fast train from Waterloo (train prices vary depending on how far in advance you book), and then there’s the reasonably priced National Express Coach Service, or there is free parking available on my drive. If you require any changes to your appointment please allow at least 24 hours notice please as these sessions are far longer than the standard, so we have more time to establish exactly what you need. Your personal and confidential session consists of your choice of combined NLP, Timeline and Hypnotherapy currently offered at double the standard time being 2 hours in duration. A single session of Quantum Healing Hypnosis Therapy™, Past Life Regression and Future Progression this is 3 to 4 hours in duration. Or 1.5 hours of Strategic Intervention Life Coaching. You will discover much about your true self and experiences, learnings and hidden strengths and have your questions answered by the subconscious, many have improved their health as an energetic exchange is experienced. Consistent feedback states that the experience is wonderful, and achieves a sense of expansiveness, energy and clarity. An empowering process where you can learn more about being in tune with your innate wisdom. Many people report they feel free, lighter – like a weight has been lifted, calm and re-energised. Focus and energy can then be applied to what you really want to have happen in your life and relationships, personally and professionally. There are numerous places to stay close by if you’d like to enjoy more time here. Upper and Lower Gardens, Bournemouth are beautiful for a walk by a stream and very close to my house and of course there are the award winning blue flag beaches just minutes away and great to relax ahead of your session and perfect for you after your session. A personal favourite is Alum Chine or Branksome Beach, there are several cafes along the front. Sandbanks, Canford Cliffs and Bournemouth itself are all beautiful and make a great day out. There are so many wonderful places to visit a little further in just 40 minutes to Lulworth Cove, Durdle Door, Lulworth Castle, Corfe Castle, Swanage, the New Forest.